In stock -This product will ship today if ordered within the next 12 hours and 12 minutes. BetterYou Complete Wellness Pack contains a full size MultiVit Spray (25ml), B12 Boost Spray (25ml) and DLux 3000 Spray (15ml). This pack helps to support energy levels, is essential for bones and the immune system, and also supports brain health and tiredness. 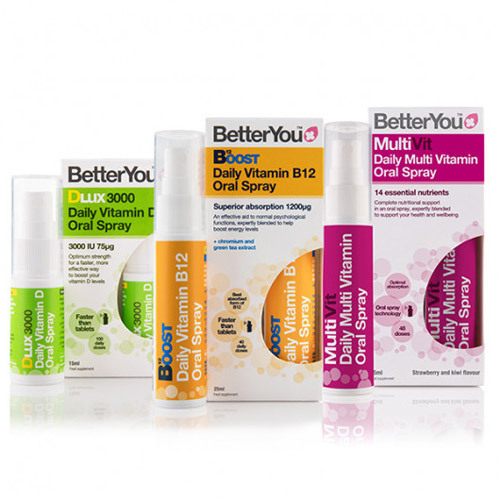 BetterYou MultiVit is the UK`s first multi vitamin oral spray with proven optimal absorption. A complete multi vitamin oral spray. Delivering 14 active ingredients directly into the bloodstream. Strawberry and kiwi flavour. Using the rich vascular system within the mouth. BetterYou MultiVit Oral Spray delivers a robust multi-nutrient formulation directly into the bloodstream, bypassing primary processing by the digestive system. This ensures a faster and more reliable supplementation. B12 Boost is a highly effective and completely natural daily oral spray with Vitamin B12, Chromium and Green Tea Extract to help increase daily energy and concentration levels. B12 Boost is particularly suited to those who travel, have an active lifestyle or are generally feeling tired. Apricot flavour. BetterYou DLux 3000 is a convenient daily oral vitamin D spray containing 3000iu`s per dose to aid bone and teeth health, support immune system and combat vitamin D deficiency. Suitable for vegetarians. Contains 100 sprays. Peppermint flavour. Shake well before use. Use 4 sprays a day (pack contains 48 doses). Carefully spray into your mouth or on the inside of your cheek. Take 4 sprays daily under the tongue or as advised by your health care specialist (pack contains 160 sprays). Use 1 spray a day (pack contains 100 sprays). Press the pump 3 times to get the liquid flowing. Shake well before every use. Carefully spray into your mouth or on the inside of your cheek. Replace the cap after use. Suitable for vegetarians, coeliacs, diabetics and during pregnancy. Below are reviews of BetterYou Complete Wellness Pack - MultiVit, B12 Boost & DLux 3000 by bodykind customers. If you have tried this product we'd love to hear what you think so please leave a review. Very good products and easy To order. Excellent product, this is my 3rd purchase, really provides a boost to my health - also used by my husband! This sunscreen is easy to apply and covers well with no need to rub in, but it's a shame that it smells like neat alcohol! bodykind were recommended and in particular, the oral sprays. I find them easy to use and am less likely to forget to use them (as I so often do with capsules). Very pleased indeed and feel these have helped me overcome a series of virus infections. Really pleased with the products, so much so that I ordered a pack for my daughter. Excellent products, so easily absorbed, am so glad these formulas exist. And am glad I found bodykind too, such good prices and service. Super way to get your daily dose of nutrients in just a few drops. Essential to have these in the winter to compensate for the lack of sun. So much better than tablets or pills, and easily absorbed. They taste great while being so convenient to take away with you. I shall be ordering again - my third order so far. Excellent value for money when bought in a sale. Unable to comment on efficacy until blood tests confirm improvement in relevant levels, but others I know have found they work better then tablets. Very good products and came fast ??. Absolutely happy with these products. I felt very tired after pregnancy, but after few weeks of using them I feel much better. Recommend it to everyone. Very very good products. Thank you so much! Since using these products over the last few weeks I can honestly say that it has stopped a cold in its tracks and that I feel so much more energised and less tired. Great value, easy to use and great taste too (apart from the sour grapes). Fantastic customer service too. Have recommended to friends and family as I think these are essential for the winter season.